John and I jumped on the Netflix bandwagon back in 2010. We didn’t bother installing cable in our home in Nova Scotia because of the costs. I’m not even sure how John found out about Netflix, but he asked what I thought about getting it for something to watch on TV. I said sure. The price was cheap and I was missing watching my favourite TV shows. We’ve been customers ever since. I was googling to find recommendations for shows to watch on Netflix, but most of the posts I came across were American. As most Canadian Netflix subscribers know there is a VAST difference in the selection between the two countries. Many of the shows I wanted to watch were not available here. Boo! I thought I can’t be the only one looking for new TV shows to watch so I decided to write a post with my personal recommendations and ones from my friends and family. 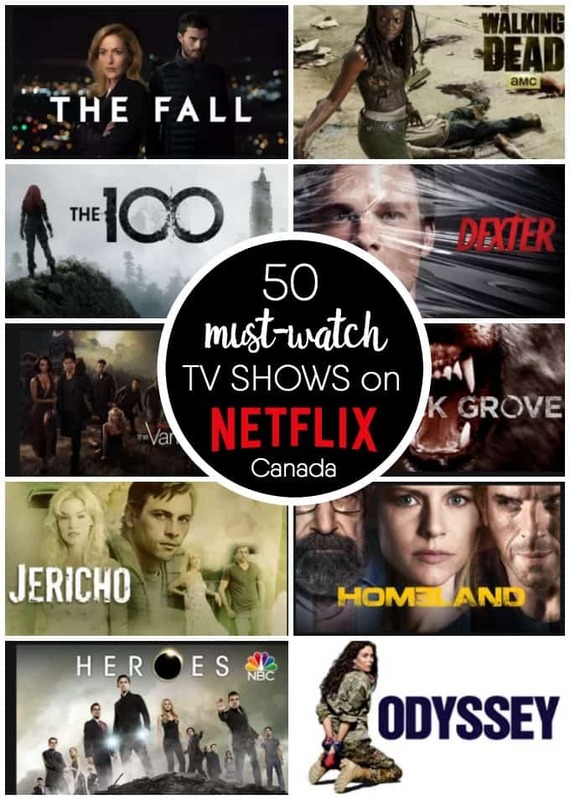 I’ve got quite the list here – 50 TV shows ready for you to dive in and binge watch! All of them are on Netflix Canada as of this current date. Number 1 to 16 are my picks and the rest are crowdsourced from my personal Facebook profile. They aren’t in any particular order except the very first one. The Fall is a MUST-WATCH. It’s my favourite. This is post is not sponsored or paid for by anyone (I’d tell you if it was anyways!). It’s just me filling a need for recommendations of good TV for Canadians. I’m always looking for new shows to watch. What are your Netflix recommendations? Definitely checking some of these out. Hemlock Grove was super awesome. Right now I’m watching Daredevil. I have never watched Grey’s Anatomy until I got Netflix. Once I started watching it I got hooked on it and became a night owl. Weeds is another great one on the list. I am catching up on Scandal (I LOVE how Netflix already has the latest season on there already!). After this, I am going to re-watch Prison Break (to refresh my memory for the new installment they are filming). Ugh – I hate that our television choices are so different; I mean, we’re neighbours (neighbors) for goodness sake! I discovered Grace and Frankie recently and love it!